A Wrinkle in Time is on my TBR! I've heard such good things about it, I don't know why I haven't picked it up yet! Happy reading! I really need to read A Wrinkle in Time, at some point. It's the sort of book everyone expects me to have read, but nope! I have a few books like that so I understand how that happens. Hopefully someday you will get a chance to give it a read. Thank you, Geybie! I can't help but stress about the blog while I'm neglecting it. I hope you have a wonderful week, too. I have never read a wrinkle in time but have heard how great it is. I hope you enjoy your break even though the circumstances a tent nice I hope everyone stays safe! 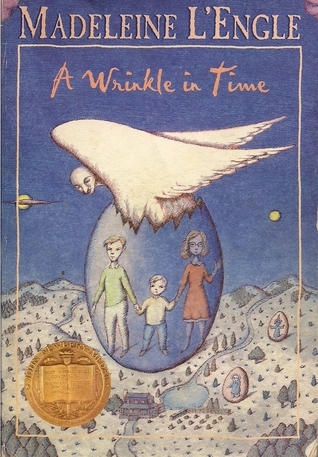 A Wrinkle in Time was a defining book for me as a child. Thank you. The rain has been constant here, but my family is safe. Too bad the kids won't read A Wrinkle In Time with you. It's always a shame when you can pass on the love. I remember R.L. Stine. Those books freaked me out. Which is rare for me. I want to watch Defenders. I loved Jessica Jones. My kids are breaking my heart with A Wrinkle in Time. Speaking of RL Stine... they love Goosebumps. They are actually passing those on to me to read right now. :) I've read a few, and I'm surprised by how scary they are. I'm reading the "Ghost Camp" one right now. I loved Jessica Jones, too. I probably wouldn't be watching Defenders right now otherwise. Ooh lovely pile! Have fun rewatching GoT! Ooh I want to start with all the Marvel TVshows!! I am quite bored wih DC ones at the moment and I have only watched Agents of Shield. People didn't like it that much and I still liked it so with all the ravings and all, I have high hopes! Hi, Priyanka. :) I watched a lot of Agents of Shield. I'm a huge Bill Paxton fan so that one season was really great for me. Unfortunately I stopped watching once Bill Paxton was off the show. I've seen all of the Marvel shows except for Iron Fist. My husband spared me on that one. You have a lot of good content waiting for you to watch! I can't wait to go through the list of books in Paperbacks from Hell. Sorry you hear you don't read them much anymore. Maybe you will get the chance to pick one up soon. Glad you are spared the worst of the hurricane! I've been watching some of the reports and the flooding looks awful. And yay for Game of Thrones (although boo that tomorrow is the finale!) I thought Defenders was decent, I like Jessica Jones a lot, and I haven't watched Ozark but it didn't look THAT great? We are still dealing with this stupid hurricane. I wish it would pass us already. Ozark is hard to explain. There are things you don't see on TV much, but I'm not sure the storytelling is solid enough for me. I don't know. I'm on the fence about it. Oooh! 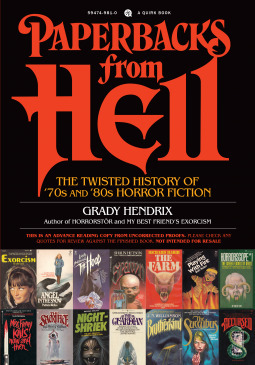 I really want to read Paperbacks from Hell! It looks so good! I will definitely post a review on it once I've had a chance to give it a read. Oh, hugs, Mogsy! I bet she will do great! My two oldest really loved Kindergarten and getting to go to school. My youngest will start next year. I hear next season's episodes may be feature length. Fingers crossed! Gotcha. I wasn't a big fan of Luke Cage. (I only watched it because I liked Jessica Jones.) If I hadn't been a fan of Jessica Jones, I'd be skipping Defenders, too. It's holding my interest, though. Continued prayers to you and everyone in Texas. I watched the first episode of Ozark and liked it, but I have to get back to watching more to see how I like it. It's been getting rave reviews. Same here, we just caught up and now it is ending! Darn you GoT!! Glad to hear you are safely out of the path of Harvey. I'm so sorry The Mist didn't get any better! I've been wondering if I quit too early. I haven't see the Dark Tower movie yet. I will, but it will be on the small screen when I do. I love Wrinkle in Time, but my sons weren't taken with it either. Odd. Stay safe in Harvey! We are trying to hunker down and stay dry. Boys. Yeesh. Deb, I hope you guys are still dry over there!! I'm ready for Harvey to move on!! I'm very excited about Paperbacks from Hell. I will definitely be posting a review soon. I have a feeling it will be a book worth grabbing. Paperbacks From Hell looks and sounds fabulous! Lucky you. I'd love to read it, being a huge horror fan myself. So happy Harvey didn't hit your area. They are now saying it will push off shore and come right back in again. I hope it stays away from you. Stay safe! Harvey did push off shore and it will be coming at us as originally predicted. :( I think we will be fine through the storm, though. My kids' schools are closed for the week, and I'm waiting to see what my work is going to do after today. Hmm. I wonder if the boys will be more compelled to read it after the movie comes out? My brother used to be like that - he'd have nothing to do with a book, but after the film he'd give it a go for "the deleted scenes". Hi, Amber. I tried bribing them with the movie... I thought it would be great fun to read the book, and then go see it at the theater. They aren't interested! I showed them the trailer... nothing! Haha. At least they have their own opinions and interests, I suppose. I'm so glad to hear you were spared the brunt of the hurricane. All of that flooding is just terrifying to see. A Wrinkle in Time is such a great book. I bought a new copy this year in hopes of reading it with my son as well. We'll see how it goes. Might be a tough sell since it's not a video game, haha. Hope you have a great week! Glad to hear you aren't in the storms direct path. I've been watching the news and hate seeing all the devastation. I can't imagine what everyone down there is going through. I hope your Grandpa is doing okay. It can be quite tiring helping them out but so worth it. I have been planning on ordering Paperbacks from Hell and am definitely going to do so after hearing how much you like it. Have a great week! This stupid storm went back out into the Gulf so we are still in its path. I think we will weather the storm OK, though. So far we have had tons of rain, and we are handling the water on my property OK. My grandpa is doing OK. He is just needing more care now than he had before. I've only skimmed through Paperbacks from Hell so far, but I am really looking forward to spending real time with it. So glad you are out of the danger zone, Jen. The footage out of Houston and the surrounding areas is so awful. I'm loving the fact that GR is now recognizing rereads, too! That's been a long time coming. (Now if they would just allow half-stars but that's a whole other conversation.) The GoT season finale... gah! At one point (and you can probably guess when) my husband jumped up from his chair and was like, WHAT?! All I can say is, well played, Sansa, The wait for next season is going to drive everyone insane. I like your idea of starting from the beginning again! Hope you are able to enjoy the few days off! Hi, Tanya. I'm looking forward to the storm finally passing. YES - Goodreads could really use some half stars. I round everything up so I guess Goodreads is doing a good job of making me look nicer than I am. :) THAT MOMENT on Game of Thrones! Finally! Yes! I'm excited what that means for sisters Stark. The history of horror looks interesting. Glad you aren't or weren't in a direct path. My heart breaks at the imagery I am seeing on the news. Hope this week is a good one and that things ease up for you soon. A Wrinkle in Time is on my TBR list. I've been watching Quanico on Netflex, love the show. Have a great day! Hi, Sherrie. :) Ooh, I've never hear of Quanico. I will look that up. I love getting recommendations. I have read every book Madeleine L'Engle has written including her nonfiction. Wrinkle in Time was great. Have you tried your kids on the Graphic Novel version? It is really true to the original. Come see my week here. Happy reading! I wish I could say the same, Kathy. I have NO idea why I haven't read the rest of the Wrinkle in Time books or her other series. I have no excuse at all. I have the graphic novel on hold at the library. We'll see if they are into it. If not, I really got that one for me... Haha. I hope you and your family continue to be safe from the storm. I meant to watch Ozark but forgot all about it. Maybe now Orphan Black & GoT have ended, I'll give it a watch. We're working our way through Big Little Lies right now. It's full of secrets and I love me some secrets :) Stay safe. It might. I like going in to it knowing next to nothing but now I'm spoiling the book for myself. It's a no-win situation, I think. Hope you continue to escape the ravages of the hurricane. Nature can be a wrecking havoc. 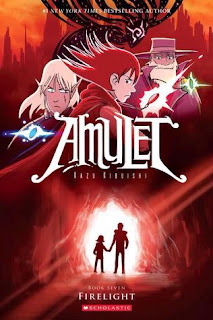 I read the earlier Amulet books but not the more recent ones. Thank you. We are still in the path, but I think we will weather it OK. I love the Amulet series. All my books are in storage right now. Come see what I'm reading. 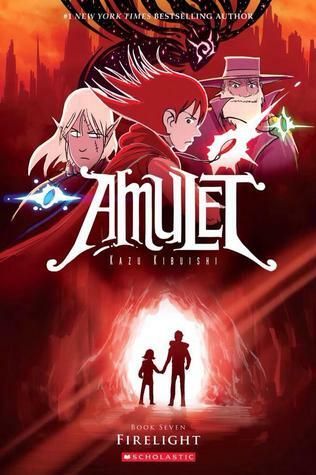 I like the Amulet series a lot, too. Such a busy time. Wrinkle in time does sound good. And, I've just literally watched all Game of Thrones - all six series in the past few weeks and just finishing up series 7 now. I'm going to miss it. It's kept me very entertained over the past couple of months. I really miss Game of Thrones having done a similar binge! :( I rewatched a lot of season one before the storm hit. I imagine we will binge them again before season 8. It must be a relief that the storm has passed you by...don't feel guilty about that! I hate storms so I like our mild climate. Love Game of Thrones so much! I've been obsessed with it and pass the time by constantly blogging about it! Weeelll, we didn't get as lucky as I thought we would. I kind of jumped the gun in saying we'd be saved. :( We made out OK, though. We got flooded in for quite a few days, but the house stayed dry. We did better than most. Sounds like you had a busy few weeks with work and caring for your grandfather. I hope you didn't get hit by Harvey, it sounds like it caused a lot of damage. I haven't made use of the re-read function on Goodreads yet, but I do think it's neat they have that option now. I hope you'll have a great week! We did get hit, but we are OK. We even managed to get my grandfather into a better home during the aftermath. He still doesn't have running water since the storm, but he's safe and he's happy. A Wrinkle In Time is a deserving classic, to be sure. My wife and I are on the final season of Parks and Recreation, but really we're just biding our time until season two of Stranger Things hits Netflix. Yeess, oh my goodness. When does Stranger Things 2 happen? October? That's going to be awesome.